Many cricket experts believe that India has the best chance of winning the Test series in Australia. The absence of Steve Smith and David Warner makes the hosts vulnerable in the batting department. But one aspect of Australian cricket that hasn’t diminished at home is the bowling. One premier factor why Australian bowling line-up is considered strong is the presence of Josh Hazlewood. Together with Mitchell Starc, Pat Cummins and Nathan Lyon, Hazlewood combines to form a formidable bowling unit. Australia can bank on these bowlers to deliver the goods in the upcoming 4 Tests against India. Josh Hazlewood came to the limelight on India’s previous tour down under. The pacer made his debut in the Brisbane Test and bagged a five-wicket haul in his side’s victory. On the other hand, an Indian batsman who was consistently delivering was Virat Kohli. This year, the contest between Hazlewood and Kohli will be one to watch out for. The Australian pacer recently said that the Indian captain likes to get on with the game and sledging brings the best out of him. He also mentioned that India’s batting depends a lot on Kohli and yet it’s close to the best batting line-up in the world. “I think we’ll obviously have a chat about him before the game starts. We’ll come up with a couple of options. It’s about what the conditions suit, with the player of that calibre, you need a few options. Virat obviously thrives on that sort of stuff (sledging and marauding). It gets him going and probably plays his best cricket when he’s doing that. It’s up to the individual – if it’s a bowler or a fielder. I’m usually quiet when I’m bowling,” Hazlewood was quoted as saying by the Indian Express. “I see the Indian line-up as the best in the world, if not right up there, led by Virat, and I think they feed a lot off him and how he goes about things. They have played a lot at home since the time they last played in Australia. They played in England and South Africa, and it was only Virat who stood out. 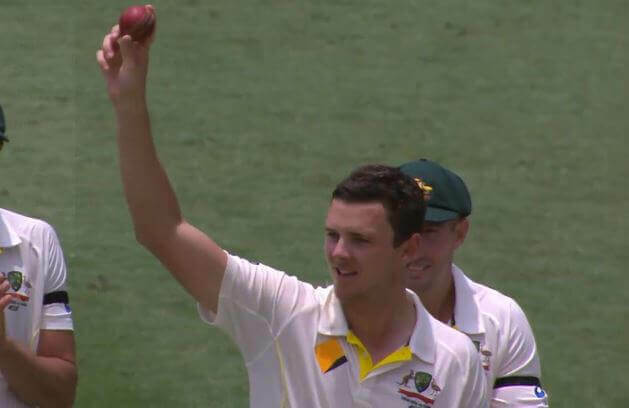 A lot of the others haven’t scored too many runs,” Hazlewood added.